After her father’s successful suicide, Holly turned to prescription pills to numb the pain of his passing. Soon, this led to experimentation and abuse of cocaine, pills and eventually heroin. Being a mother inspired Holly to make a change in her life and be there for her son. Watch Holly’s full story here. Pam’s sister was in recovery for 10 years. Then, she started using again. Fearing each day would be her sister’s last, Pam made the call to NJ Connect for Recovery. We’re here to listen. See her full story here. As a former Wall Street executive, Mac shares his story and how he knew he needed to get clean because he started losing time with family. For Mac’s full story, click here. Lynda’s son Matt began experimenting with substances at age 12. Desperately wanting to help her son with his substance use disorder, Lynda had to learn how to help herself first. She found NJ Connect for Recovery and it changed her life. Call us today for immediate guidance and support :855-652-3737. For most women, becoming a mother changes their life. For Michelle Price, becoming a mother saved hers. 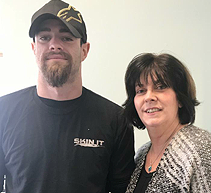 Learn how NJ Connect for Recovery and MHANJ helped Michelle on her recovery journey. Click here for her full story. Tonia’s son Roger coped with substance use disorder for years. Learn how parents can be the most effective tool in their child’s addiction recovery. For Tonia’s full story, click here. Each week Tonia Ahern makes her commute to Ventnor where more than a dozen family members will gather. On this particular night, the meeting topic will be communication with a family member or friend who is living with addiction. The evening’s presentation will include tips on how to talk like a “motivator,” what’s an open-ended question, and how to let the person talk. It’s part of a series called Family Education Workshops, which are funded by NJ Connect for Recovery initiative. Ahern is one member of the team that provides these across the state. For family members and friends who are facing a crisis and associated high levels of stress, the workshop teaches and reinforces methods that will benefit themselves as well as their loved one. “A healthy family can be the strongest tool,” says Ahern. Ahern wants participants to view themselves as part of the recovery process. She knows – and research confirms – that the success of recovery is related to the family. Another week, Ahern will cover how family members and friends can learn to forgive themselves. In a different session, she will teach self-care and why it’s healthy to take time-out for recreation, pastimes and hobbies. There also will be a workshop on mental health and education on addiction as a disease. Once a week for 12 weeks, Ahearn and the participants will work on an aspect that aims to offer support and education. “They may begin the meeting telling their story in tears, but by the end, they find that they feel less alone, more understood,” says Ahern. Ahern knows firsthand the importance of this support system. Her son was diagnosed with a mental illness, bipolar disorder, in his teens. He preferred street drugs over prescription medication, which is a battle he and the family have fought for the past decade. When it all started, Ahern found comfort and reassurance through a friend whose daughter also lived with addiction. She also found support through online resources. During a chance meeting with MHANJ CEO Carolyn Beauchamp, Ahern was asked to consider teaching these workshops. Ahern accepted. Since June, she has reached about two dozen people. Find a workshop – or tell others – by sharing the NJ Connect for Recovery call line 855-652-3737.